[16 Mar 2017] For those who love the beach and diving in Tioman and nearby islands, you have an additional express bus service option to Mersing Jetty, the gateway to Tioman Island. KKKL will start a daily coach from Singapore to Mersing from 17 March. Pick-up points are located at Textile Centre and Bugis MRT Exit D Taxi Stand. One-way bus fare from Singapore to Mersing starts from SGD35 and the bus ride will normally take between 4 to 5 hours. [Update] Please note that the new pick up point at Kovan Hub 206 has replaced the one at Textile Centre. 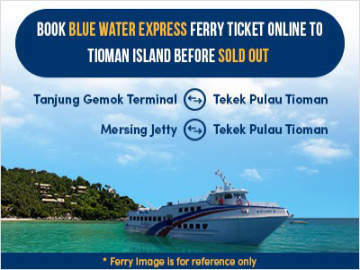 Passengers can also choose to drop off at Tanjung Gemok Jetty where the timing of the ferry to Tioman Island is more reliable than Mersing Jetty. 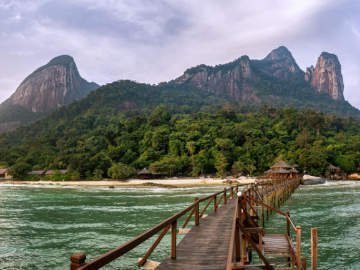 However, Tanjung Gemok Jetty is another 40 minutes drive north of Mersing so you will to factor in the additional travel time to plan for your trip. To book your bus tickets to Mersing, click BusOnlineTicket.com or Easybook.com. KKKL Express is operated by KKKL Travel & Tours Pte Ltd and is a subsidiary of KKKL Sdn Bhd in Malaysia. Over the years, it has grown to become one of the largest express bus operators in Malaysia.